The most commonly used PV cells in the industry are crystalline silicon and thin films PV cells. The market is currently dominated by crystalline silicon PV cells but thin film PV cells have also started gaining importance in the industry. Crystalline silicon PV cells have occupied around 80% of the market share so far but this is expected to fall on account of shortage of silicon and high manufacturing costs. Crystalline silicon PV cells mainly comprise mono-crystalline silicon, poly-crystalline silicon and ribbon silicon while thin film PV cells comprise cadmium-telluride (CdTe), copper-indium diselenide (CIS), copper-indium gallium diselenide (CIGS), amorphous silicon (a-Si), and others. There is a need for thin film PV technologies to continuously increase efficiency which translates to lower system costs coupled with high energy production. Manufacturing costs also need to be brought down in order to achieve competitive pricing. Improvement of efficiency from the current 7-14% to 9-17% in the next three to four years is the main area of interest in the industry. Some of the research labs have registered conversion efficiency as high as 30-40% and this has become a new source of interest among the key stakeholders of the market. Low cost and optimum efficiency of thin film PV cells is driving the growth of the thin film PV in overall photovoltaic market. The global thin film photovoltaic market is expected to grow from $3,406 million in 2009 to $19,422 million in 2015, at an estimated CAGR of 32.2% from 2010 to 2015. The amorphous silicon market is contributing maximum to the total thin film PV market. On the other hand, CIS/CIGS are expected to grow with a maximum CAGR of 43.9% from 2010 to 2015. While grid connected power supply application is expected to have the highest CAGR of 39.1% from 2010 to 2015. With an increasing usage of thin film PV cells as isolated power sources in consumer electronics, military and space applications, etc., the market for grid-connected PV cells is also increasing at a decent pace. Ten years down the line grid connected power supply application is expected to dominate the market for which CIS/CIGS cells will be the most used thin film cell. With governments of almost every leading country encouraging the usage of PV cells through a number of initiatives and benefit schemes such as funding for the development of new plants, feed in tariffs and so on, it is expected that the thin-film PV cells market has the potential to overtake conventional and bulky silicon PV cells in the future. 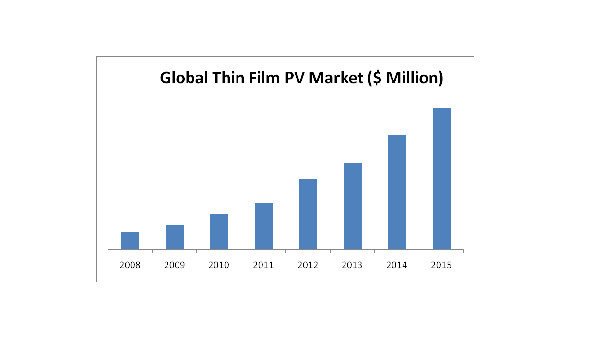 Some of the major players in the thin film PV market include First Solar (U.S.), Kaneka Corporation (Japan), Bosh Solar (Germany) Unisolar (U.S.) and several others. Among North America, Europe, Asia and ROW, the European region has contributed highest towards thin film PV market on account of increase demand of solar energy especially in countries such as Germany, Italy and Spain. Each section provides market data, market drivers, trends and opportunities, top-selling products, key players, and competitive outlook. This report also provides market tables for covering the sub-segments and micro-markets. In addition, the report makes ways for more than 35 company profiles covering all the sub-segments. Rising energy costs coupled with climate change such as increasing of earth’s temperature are driving the increase in dependence on renewable energy sources such as solar photovoltaic (PV) technologies. Continuous advancements are being made in the field of PV along with significant reductions in cost; which, in turn, is driving further adoption of such technologies. The global thin film photovoltaic market is expected to grow from $3,406 million in 2009 to $19,422 million in 2015, at a CAGR of 32.2% from 2010 to 2015. The thin-film PV cells’ market share in the overall PV market has increased significantly in last two years with the market share of thin film PV in 2009 jumping to 21% from 14% of 2008. This is expected to each around 23% by the end of 2010, which is one of the fastest spreading products in the solar energy domain market. The most important types of thin-film PV cells are amorphous silicon (a-Si) PV cells, Cadmium telluride thin-films (CdTe), copper indium diselenide/ copper indium gallium diselenide (CIS/CIGS).